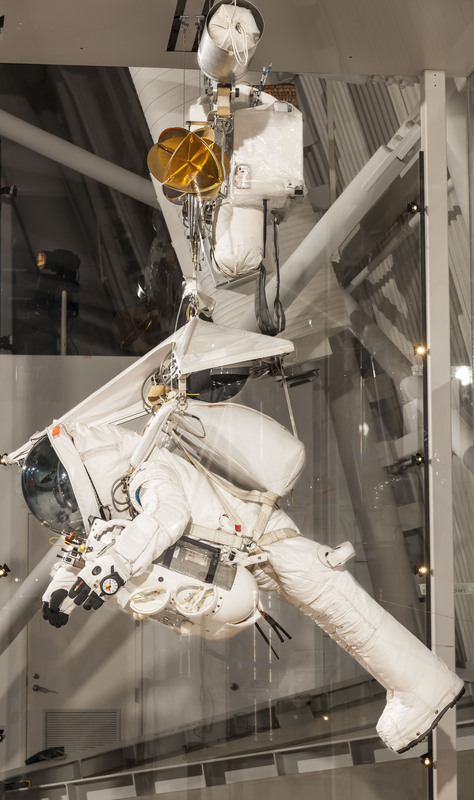 The suit Alan Eustace wore during his record-breaking freefall jump in Oct. 2014 is now on display at the National Air and Space Museum's Steven F. Udvar-Hazy Center in Chantilly, Va. The suit he wore is a one-of-a-kind system manufactured by Paragon Space development, United Parachute Technologies and ILC Dover, the company that has made spacesuits for NASA since the Apollo program. It is made of both state-of-the-art materials and off-the-shelf technologies. The balloon equipment module, also on display, had to both stabilize Eustace’s body through the initial stages of his jump from the stratosphere where there is little or no air resistance and take the strain of a gas balloon the size of a football stadium.